This morning, the U.S. Postal Service celebrated Earth Day by unveiling a new Forever international rate stamp inspired by a simulation of sea surface temperatures from a NOAA model of the Earth’s climate. 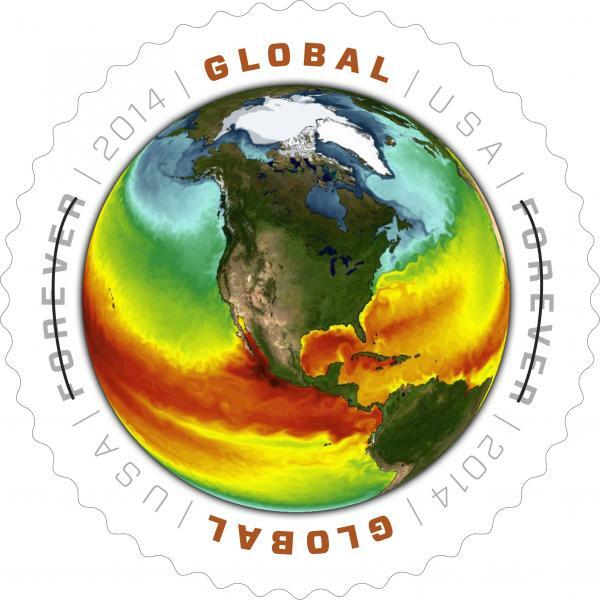 The round stamp depicts the globe with North America in the center, surrounded by vivid bands of blue, green and red, signifying the varying temperatures of sea surface waters. Mark Schaefer, Ph.D., assistant secretary of commerce for conservation and management and NOAA deputy administrator. "These global models are key to understanding changes in our dynamic planet over both the short- and long-term, and they are major sources of the environmental intelligence NOAA provides each day. Armed with this kind of information, decision makers can help communities plan for and take action to become more resilient in the face of Earth's changing climate." The image was chosen through the Postal Service’s public process that begins with suggestions from citizens to the Citizen Stamp Advisory Committee. Several months ago, Postal Service representatives contacted scientists at NOAA’s Earth System Research Laboratory in Boulder, Colo., to ask about a sea surface temperature animation on NOAA’s Science On a Sphere website. The sea surface temperature image came from NOAA’s Geophysical Fluid Dynamics Laboratory in Princeton, N.J., where teams of scientists have been modeling the behavior of the oceans and atmosphere since the 1960s.